The Voodoo-Axe is our latest fuzz guitar effect pedal and has many of the qualities the Axis Fuzz which I designed for Jimi in 1968. Jimi used the original Axis on the landmark recording 'Axis Bold as Love' and the Voodoo-Axe is an evolution from my original design The original Axis Fuzz is still in production today but the Voodoo-Axe offers an alternative and exciting range of new modern tone colours for those who want to experience the same basic sound qualities of the original but extend and modify the tone to suit today's music. I have taken this great classic fuzz sound and added a very effective passive Tone control which extends and tightens the low end response without becoming woolly and indistinct. The very tight and extended low end was expressly designed to compliment the use of dropped tunings and dynamically responds very well to this new range of modern sounds. The Voodoo-Axe reacts in a human way to the players touch as it uses a significant part of this information to continuously adjust it's operating point. The quality of distortion produced is very musical to the ear and responds well to the use of chords. The Guitar volume control works in perfect harmony with the unit to control the amount of distortion. The background noise is very low and encourages the use of lots of sustain without hiss and the extremely large output swing will drive the front end of any amplifier to its limit. It has the highest output level of any of my distortion or fuzz units and you can use it very effectively as a power booster. Electronically the Voodoo-Axe shares all the same basic Voodoo Series features with dual output buffering or hard wire output etc. The distortion section uses a unique combination of the best discrete and IC design techniques to emulate the type of distortion found on many classic tube amplifiers. It allows the player to create a wide range of distortion effects from mild to extreme whilst reacting to the most subtle nuances in touch and playing. The Voodoo-Axe is housed in our Classic Style enclosure with both dual direct drive buffered outputs or hard wire output and has provision for an internal 9-Volt Battery (battery life 150Hrs) or can be powered from a 9-Volt DC Power Adapter (not supplied). Extensive internal filtering ensures that noise free operation is maintained even with the most basic of adapters. This feature feature is standard on all our voodoo series and in effect reduces the output lead length to zero. This results in GREATER DETAIL and FIDELITY than using two long lengths of guitar leads in traditional hard wire bypass set-ups. The problem of CABLE NOISE induced by vibration on stage is eliminated together with electrical magnetic interference induced into shielded cables from lighting rigs etc. Possibly of more importance there is no TONE SUCKING at all from the output length of guitar cable. After all the ULTIMATE GUITAR CABLE would have a lead length of zero, and guitar players can detect the difference between long and short cables easily. The overall signal quality in the unit is thus guaranteed right up to amplifier and this overall performance exceeds any other method in use today. 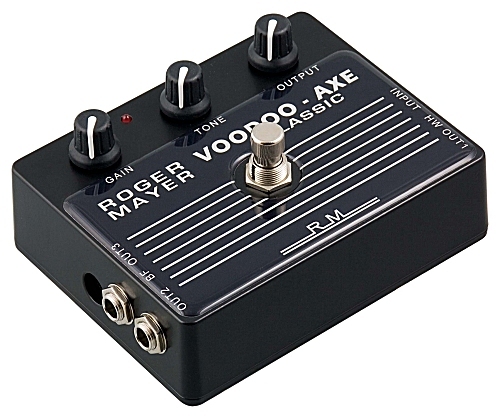 When using a Voodoo-Axe as the last device in a signal chain the distance to the amp does not come into consideration and long leads can be used successfully in recording situations e.g. : playing in the control room.